Have you heard about Serena Williams’s latest couture kerfuffle? In January, the tennis great competed in the Australian Open wearing a bilious green jumpsuit and fishnet stockings — to mixed reviews from fans and critics alike. This highly publicized fashion faux pas comes after Williams donned a controversial catsuit for last year’s French Open. French Tennis Federation president Bernard Giudicelli banned her from wearing the skin-tight, solid-black suit, but not before it caused quite the stir. While opinions may be divided on what Serena Williams wears, it’s clear that she derives confidence and swagger from her tennis outfits. Could you gain a similar benefit from a ping pong outfit? The answer may surprise you! First, What Do the Regulations Say? In addition, players must wear socks and soft-soled shoes. Their clothing must be a colour that contrasts with the ball. Lastly, the opposing players must be dressed differently enough that it’s easy for spectators to distinguish who’s who. Those of us who don’t compete at an Olympic level in table tennis should still pay some attention to our duds, however. Clothing shouldn’t be too tight that it restricts movement or is uncomfortable. On the other end of the spectrum, you don’t want clothes to be too baggy, either. That could get in the way of properly wielding your paddle. An ideal ping pong outfit would consist of elastic-waisted shorts or pants, like sweats or joggers, and a loose but not baggy shirt. A regular old t-shirt or tank top will work just fine. Make sure to wear closed-toe shoes like sneakers. 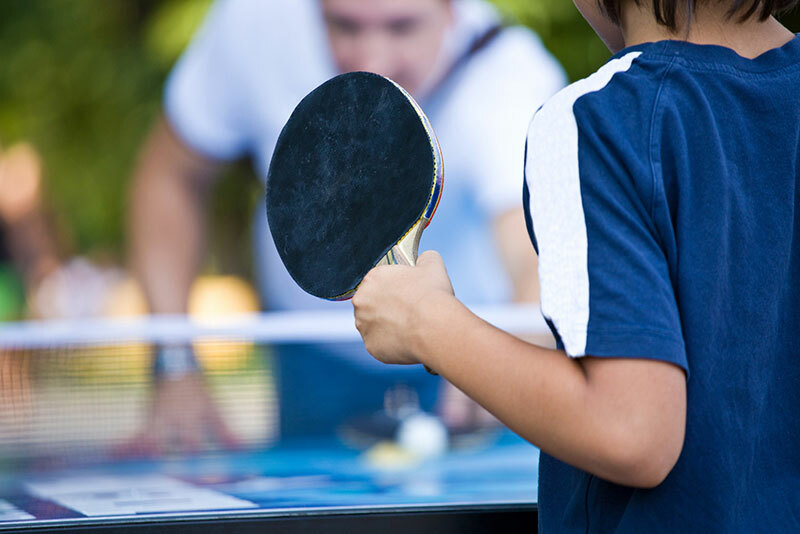 Playing table tennis involves a lot of quick, start-and-stop lateral movements. If you go barefoot or wear sandals, you run the risk of stubbing your toe or injuring your feet. Clothes make the man. Dress for the job you want, not the job you have. These popular says point to the psychological edge that the right outfit can give you. And chances are you’ve experienced the phenomenon yourself. When you put on a suit, dress, or pair of jeans that you absolutely love and feel confident in, it shows! There’s a little more spring in your step and you feel like you could conquer the world. Science backs this up. Putting on the proper fitness gear gets you in the right mindset to work out and compete. It’s called “enclothed cognition,” and it can improve your focus, motivation, and even your physical performance. At first glance, it might seem silly that your outfit choices could affect your table tennis game. But it turns out that selecting the perfect ping pong outfit and dressing for success are one and the same. Ready to take your game to the next level? Check out these expert player tips and tricks to help advance your play!